"Mom makes these and I love them so I thought I'd share them with you. They don't stay around long! They are soft and yummy and kids love them." Beat in eggs and vanilla extract until smooth. In a separate bowl, whisk together both amounts of flour, salt, baking soda, and baking powder. Mix flour mixture into the liquid ingredients. 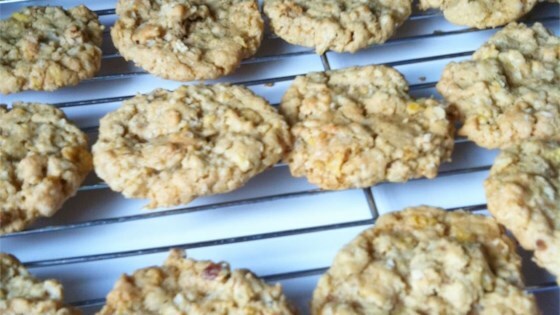 Gently mix rolled oats, corn flakes, and coconut into the dough until thoroughly combined. Drop the dough by tablespoons onto baking sheets. Bake in the preheated oven until the cookies are light golden brown, 10 to 12 minutes. These were just mediocre. I found them to be very dry. Nothing special at all. Will not make again. Not as good as my Betty Crocker recipe.